Kevin Jeffrey Phillips, born on February 20, 1967 in Saginaw, Michigan, went home to be with The Lord on April 14, 2019 at 6:22 pm at the age of 52. Each and everyday he lived his life abundantly and joyously, even when doctors said it was impossible. Kevin devoted much of his life to the Transportation Industry working at Greene Worldwide Transportation (GA), Cobb County Schools (GA), Marietta City Schools (GA), and Lonestar Coaches (TX) to name a few. He later became self-employed continuing in transportation. During his tenure in this field, he touched the lives of many ranging from entertainers, children and just about anyone he met. Kevin would always leave a lasting impression and a smile on your face, even if you only knew him for a moment. He always had a word of encouragement, uplifting someone's spirit and constantly sharing the Word of God with those he came into contact with. During his years spent in GA, Kevin coached AAU Basketball alongside his brother Billy (William). Together they helped to develop the lives of many student-athletes, building lifelong relationships with those that they coached and mentored. 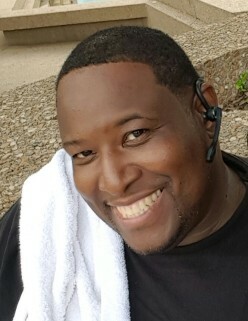 Kevin was a dedicated member of Destiny Church in Marietta, GA for many years before relocating to Texas. Upon his return to GA, he became a member of Enlightened Christian Center in Marietta,GA. Kevin was a graduate of Buena Vista High School in Saginaw, MI. He attended college at Georgia State University, Kennesaw State University and Southern New Hampshire University. He was a part of Phi Beta Sigma Fraternity. Kevin was preceded in death by his father, William C. Phillips, Sr., his mother, Vezelia Phillips (Brewster), his grandparents, Sadie Burrell and Walter Brewster, his great grandmother, Betty Tubbs and his god-father Walter M. Giryer. Kevin leaves to cherish his memories, his wife, Meka Phillips, his puppy, "Sonny,” his brother, William C. Phillips Jr,his other brother, Jared Berry (Detroit, MI), his sister-in-law, Tracey Phillips (Austell, GA), his aunts, Louise Lawrence, Corine Phillips, and Louise Phillips (Murfreesboro, TN), his cousins, Kingsley Berry (Detroit, MI), Don Berry (Grand Rapids, MI), two daughters, Ayla Jackson and Lele Coleman, two sons Xavier Gilstrap and Aaron Gilstrap, step daughter LaChauna Waters, seven grandchildren, a very special nephew Brandon Dobbs, Yolanda "Punkin" Smith who was like a sister to him and her husband Rev. Megale Smith Sr, his closest friend,Darrell Beemon and many others who loved him dearly and whom he loved. His laughter, his big ole smile, his white towel, and his infectious humor will forever be a part of us. Funeral Services for Kevin will be held on Saturday, April 20, 2019 from the Chapel of Clark Funeral Home at 3:00 PM with Pastor Bryant Bell officiating. The family will receive friends at the funeral home on Saturday, April 20, 2019 from 12:00 Pm until the service begins at 3:00 PM. In lieu of flowers the family respectfully asks that donations be made to St. Jude's Children's Research Hospital. There's still time to send flowers to the Visitation at the Clark Funeral Home from 12:00 PM to 3:00 PM on April 20, 2019.